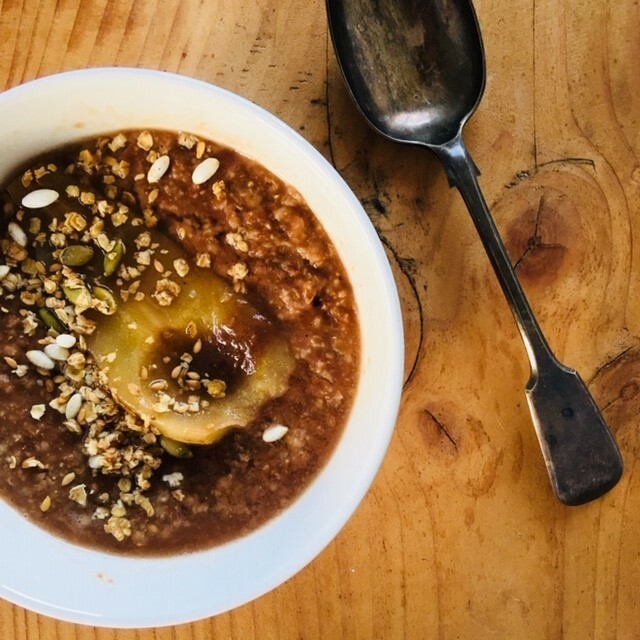 It’s always a little harder getting up on these cold dark mornings, but knowing there’s a super tasty breakfast waiting makes it a little easier…..these poached pears on top of a bowl of a hot porridge will have you jumping out of bed! Place water, sugar, dates and spice into a small/medium saucepan and bring to boil. Once boiling reduce heat and stir until sugar is dissolved. Once softened mash dates into liquid. Meanwhile peel pears and use a melon baler to scoop out the cores. Add pears to liquid, bring liquid back to boil and then reduce to a low simmer, cook pears until soft, 5-7 minutes (You want the pears to retain their structure). Remove from heat, transfer pears and liquid to a container and leave to cool. Serve on top of porridge or with a spoon of coconut yogurt and a sprinkle of granola.